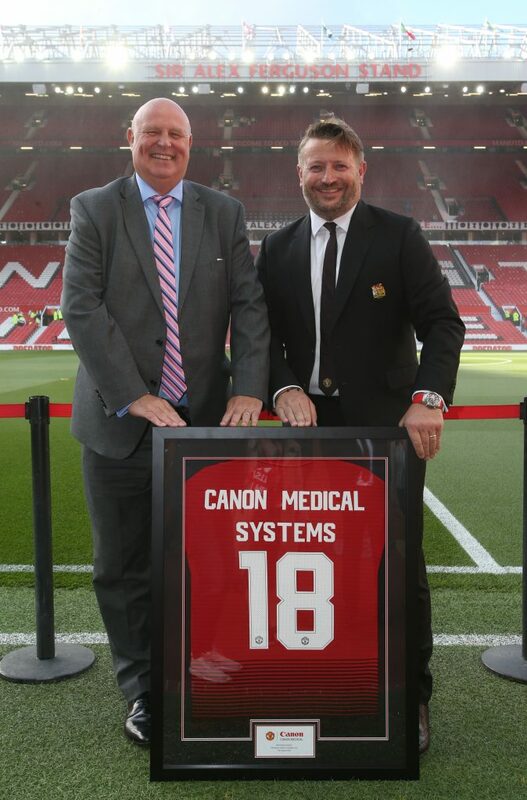 Zoetermeer, the Netherlands/Manchester, United Kingdom, Manchester United Football Club has announced a renewed multi-year agreement with Canon Medical Systems Europe as its official medical systems partner. The unique partnership will ensure that world-class players continue to gain instant access to advanced imaging equipment to examine injuries and undertake pre-emptive screening for preventable injuries, improving player welfare and maintaining career longevity at an elite level. The collaboration will also continue to push the boundaries of medical research and through translational methods, will benefit patient populations and healthcare professionals internationally. The agreement between the two iconic organisations was first signed six years ago and top-of-the-range imaging modalities including CT, MRI and Ultrasound were installed into a dedicated Medical Centre at Manchester United’s Aon Training Complex. The renewed contract will continue the diagnostic imaging partnership benefitting players and staff at Manchester United Football Club, clinical communities operating in sports medicine and ultimately patients in the wider world. Studies seeking the answers to prevent clinical conditions, improve diagnosis or enhance treatment in the areas of cardiology, musculoskeletal (MSK) and sports medicine are regularly undertaken at the Aon Training Complex. Research initiatives conducted throughout the partnership have been presented at high-level European Cardiology conferences, all of which have been very well received. This includes ‘Musculoskeletal MRI in Football Medicine’ and ‘Exercise Myocardial Performance in Adolescent Athletes’ research to extend knowledge and understanding in the fields of sports medicine. “During the past six years, our partnership has redefined the standard for medical imaging in elite sport. Daily access to state-of-the-art equipment and intelligent technologies has improved responsiveness to clinical presentations. Most importantly, we have developed a concept of ‘performance imaging’ over and above clinical diagnostics. Caption: Mr. Mark Holmshaw, CEO and President of Canon Medical Systems Europe BV (l) and Mr. Richard Arnold, Group Managing Director, Manchester United Football Club during the Premier League match between Manchester United and Leicester City at Old Trafford on August 10, 2018 in Manchester, United Kingdom.